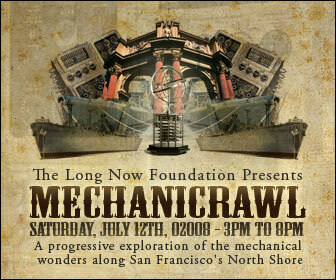 The Long Now Foundation presents Mechanicrawl, an exploration of mechanical marvels which takes place this Saturday, July 12th in San Francisco. Here a video of The Long Now Foundation’s Alexander Rose introducing Mechanicrawl. This Saturday a very special event in San Francisco ties together several of SF’s most storied attractions, all of which have a mechanical bent. These metal gears and pistons beget unimaginable wonders–touching the fantastic by way of the practical. It’s an event not to be missed. Mechanicrawl offers a chance to experience the treasures of San Francisco in a unique way. There will be special access and demonstrations during the event that are not standard at these attractions, emphasizing the details of particular mechanical features. There’s a good chance that some other mechancial and steampunk wonders will materialize in the vicinity. It’s not at all a bad idea to wear your mechano-Victorian best. Tickets are on sale now. Members of the organizations can get in for free (contact your organization for details). The participating attractions in Mechanicrawl are The USS Pampanito, SS Jeremiah O’Brien, Musée Mécanique, San Francisco Maritime National Historical Park, The Long Now Foundation, and The Exploratorium. Featured machines range from games at the Musée Mécanique that are over a century old to The Long Now Foundation‘s most recent creation the “Walking Bearing” which was completed this year. The Jeremiah O’Brien made history as part of the D-Day invasion, while The Exploratorium insures our future by educating and delighting children (of all ages) with the wonders of science. The Mechanicrawl website helpfully assists you in planning your route whether by bike, bus, on foot, or even (ewww!) by car. There are also suggestions for food & drink along the route. There will also be Twitter updates about event the day of; you can follow Long Now to get them. The mechanical computer, known as a Torpedo Data Computer, on the USS Pampanito is an early electromechanical analog computer that was incredibly compact for its time in order to fit on a submarine. It has been rebuilt to working order and will be demonstrated through the day. 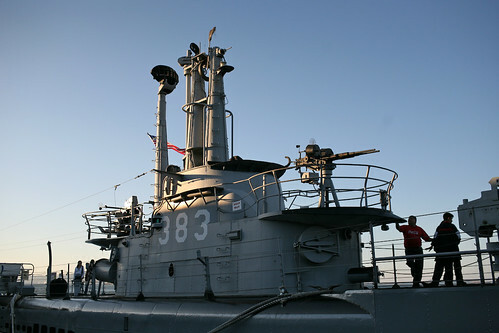 The Jeremiah O’Brien’s 3-story tall steam engine (shown above) will be running throughout the event. The ship, which stormed the beaches of Normandy, is celebrating it’s 65th anniversary and is one of only two seaworthy Liberty Ships in existence. Mechanicrawl-goers will be able to go into her engine room and see the engine going at full blast. I recently rode on board the O’Brien–you can see my pix and video. 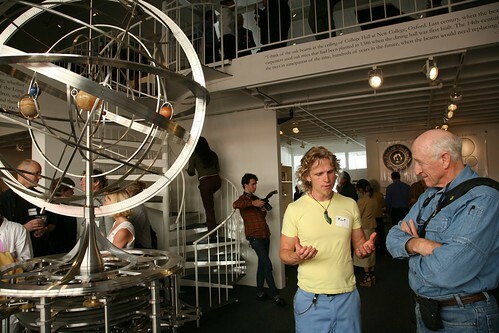 Organizers of the event, The Long Now Foundation are located in Fort Mason and are dedicated to fostering long-term thinking and responsibility. As part of this mission they are building a clock to last for 10,000 years. This incredible mechanical wonder is being designed with millenia in mind and will do much more than keep time, including detailing the relative positiion of planets in our solar system. There is a lot of mechanical goodness to see up close at their Museum and Store. Details on picking up Will Call tickets are up now on the Long Now Blog as is information about a few other events going on in the area that day.